Axlada remains a charming place for those who love the solitude of quiet walks and always subject to improbable encounters. 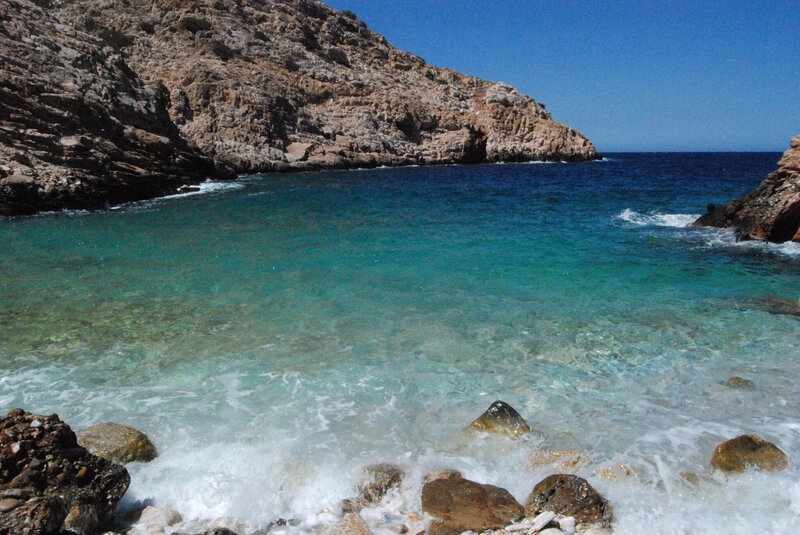 I usually stop at the village of Ksévris, the first village at the exit of Artemonas, on the way to go to Cheronissos. 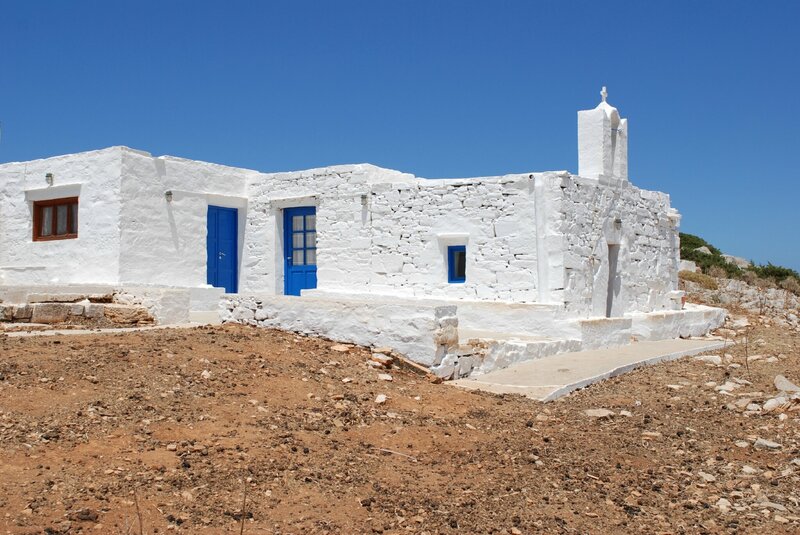 Then I take the path that leaves the small church of Ayios Minas on the left, bypass the few houses and down on the east coast of the island towards Ayios Sostis. The first part of the road is dotted with stone walls and beautiful figs but also plots of land on terraces occupied by goats. The road continues until you see on the left some steps leading to a wooden gate of green and brown colors. Open it and close it then to take the direction of Ayios Sostis. 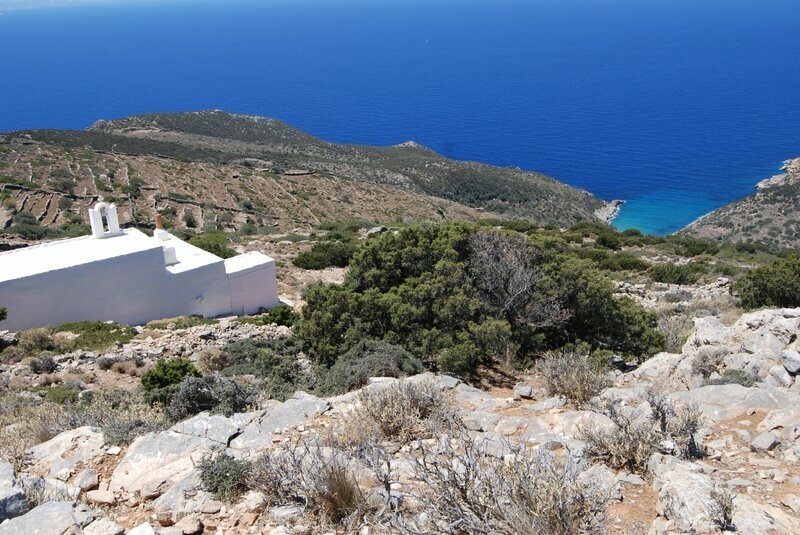 The mountain on the left, a stone wall on the right, the landscape becomes lunar and desert until new steps let us see the peninsula where is the church of Ayios Sostis. At some point, when the church is in front of us far below, a path goes on the left to go behind a mountain pass and the path to the farm Antonios looming on the horizon. This time there was nobody so I have decided to continue with the descent to Axlada, without a path and paying attention to rocks’ scree. As for Avlaki, the sea was beautiful and quiet which made the ride even more enjoyable. As it is a very small funnel bay, it carries a lot of waste becoming offshore. Pity! But that does not detract from swimming and enjoy! One last thing: the climb is rough, you will face the sun, provide a lot of water! The departure for Avlaki is never obvious because there are two possibilities for travelers. one from the tarred road but with the difficulty of keeping a car and the second more rural past Artemonas, a small road also tarmac returns to Agios Loukas and a small cemetery looking towards Paros. Just after taking this road, a path starts between two properties and begins to descend towards Agios Metamorfosi Sotiros. However, the path is divided in two. Leave Agios Sotiros on the right and take the path back down to Anna's farm. The path is then lost in a bamboo forest that is important to cross (small jungle). The path that follows is in a way, a mixture of improvisation and common sense. This year 2018, the sea was calm and swimming fantastic. The way back that I have chosen following a path from the bottom was a nightmare! Finally, the goal was to go up, even if it was necessary to pass some terraces invaded by shrubs. This remains a good memory. Not for my legs and my shoes nevertheless! This short walk (1.30 max from Vathy to the beach) is always a "must do" as it offers you to create your onw path when you arrive at the highest point (148 m) called Vounakia. There is a farm at the place Skouryialou where is dog is always woofing if you disturb it. The landscape is a mix of very old olives trees, goats looking for shadow and ocher ground with an alternative way passing through the left of vounakia (small mountain in Greek) which has to be tested by next year. Then you have an hollictic view of the bay of Xoxlakoi but the most exciting in coming. As I have already described the descent, i will just insist that you have to be guided by your instinct. There is no obvious way to go there, just take the terraces one by one, use some shortcut inbetween, be careful if sometimes the slope can be slippery. Some photos are showing the width of the terraces. Before arriving downwards, there is tempting option to use the first gate drowned in the bamboo forest but it it requires some contortions in fairly dense vegetation so i suggest usually to avoid and cut by the left through a field of dried grass bordered by a single row of bamboos. Cross the wooden blue gate and the peeble beach is for you! Funny story when going back, I crossed a flock of goats that are normally frightened when someone comes to them. But take a break sit down, and they will come, little by little, to you. 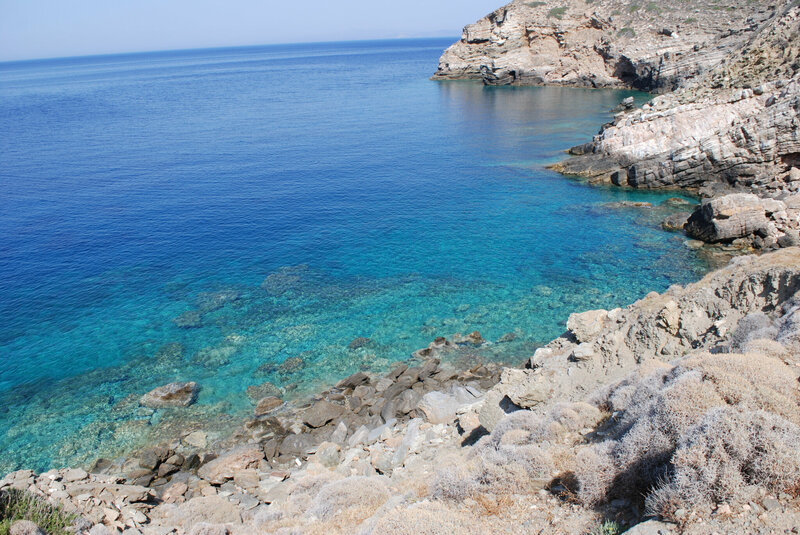 have a look at the pictures (Hiking in Xoxlakoi July 2009)! Apollonia is so nice when there is nobody strolling through the numerous streets and paths. It We go there everyday to fell the quietest moments compared to the evening when the village wakes up for the night and the crowd. 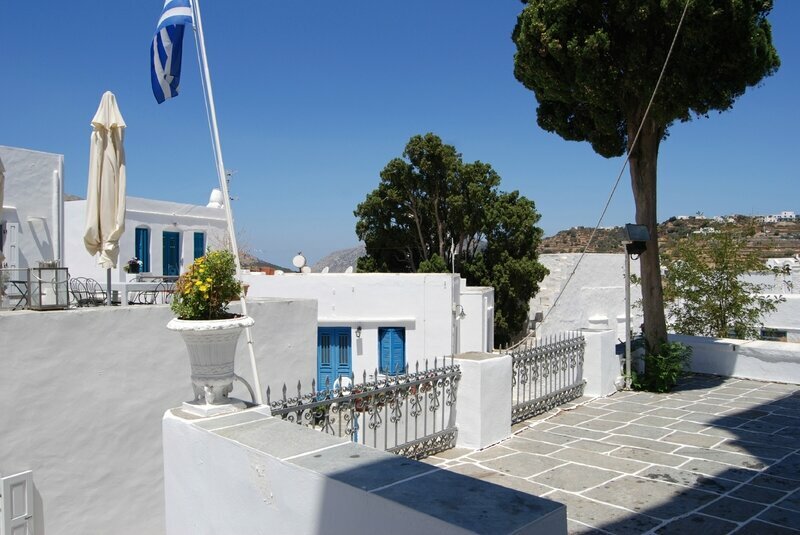 it is the time to go for a coffee to Rampagas and when the belltower from Ayios Spiridonas rings, it is time for us to leave back to Kamares. Steno (the main street) crossing the village from the main place to katavati square is a fabulous example of cycladic village but the main advantage with Apollonia, and with Sifnos in general, is the inhabitants who take care of their house, always painted and maintened, so many flowers and a cleanliness that you cannot find even in France wit our preserved villages! This is why we cannot get tired of Apollonia! Some pictures are available at eponym folder. 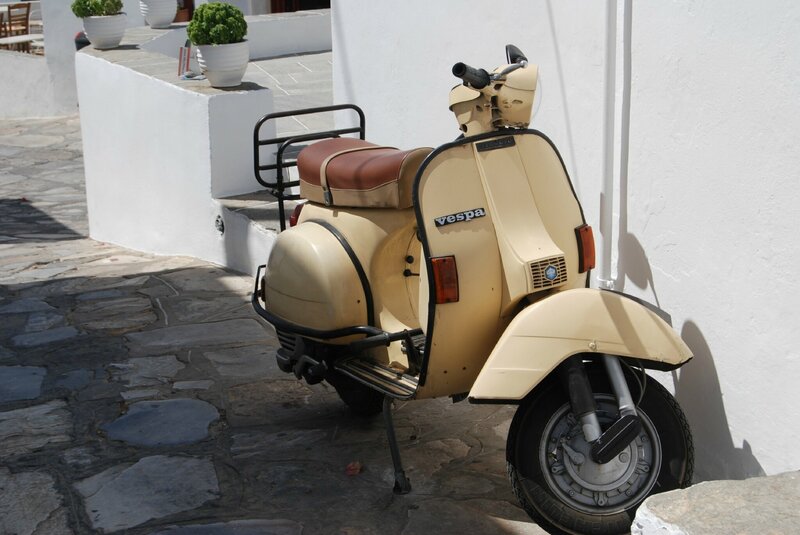 This folder shows some photos taken here and there during our vacations in Sifnos. Random situations when you cross someone, something. These are part of the numerous photos taken every year! I went one time to Vlichada (see old story and pictures) and said that I would never try a second time there as it had been a nightmare to go down the mountain without any possibility of clear pathway. Nevertheless, last year, I tried to use a different way from the left side of the bay starting from the ground round close to Panagia tou Niyiou and then take the direction of Ayios Polikarpos but cutting right before this church and continue to the Farm of Zambeli. Satellite picture was showing before the farm another way to go down to Vlichada but I missed it as my telephone decided to not catch any GPS network! The best I have done is to stop some 50 meters height from the sea level but without any easy solution to reach the beach. However the trek was really nice, quite as usual with some old farms and nice pictures! See the folder. Last year, I tried another way, not from Seralia but from a pathway through Ayios Nikitas, then Ioannis tou Siderou, taking the direction of Prosfiri but turning left just before a farm. The descent is a little dangerous with slippery rocks. According to your way of arrival, you can either arrive directly from the trough between the cliffs or on the left side crossing a bamboo garden with house. The bath is quite OK when there is no wind and waves. A lot of white round peebles and a curious holy font carved in the rock. Vlichada is not an easy place to reach. 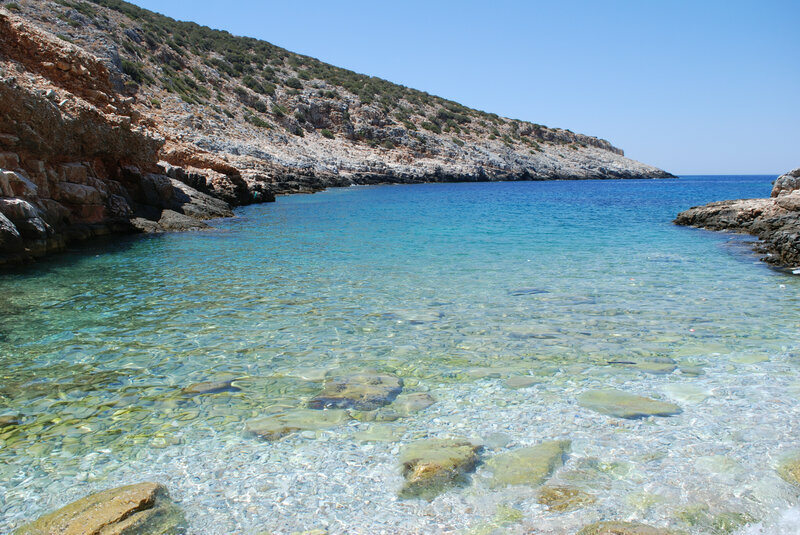 As there are 2 locations on the island (the first one called "Vlichadas Bay” is in the south west, just between Vathy and Vlasi (under Tosso nero). 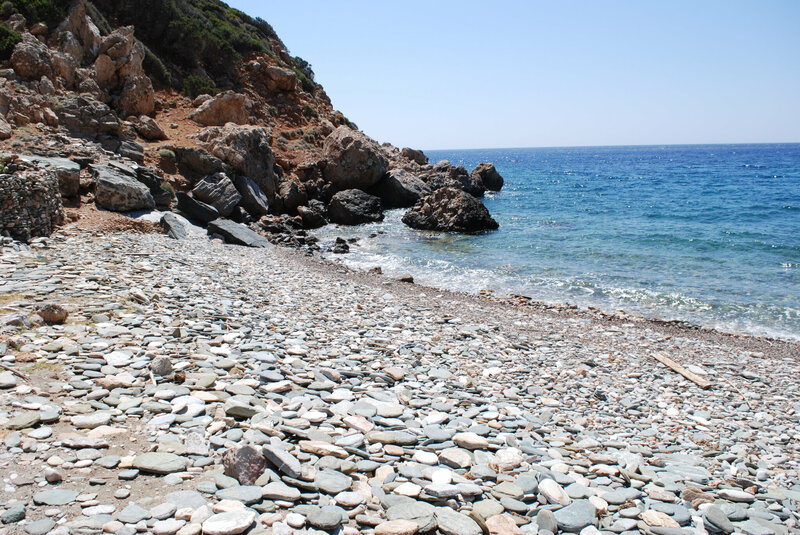 The second one where we walked to, is located in the North West, after the church of Ayios Sostis (same pathway) but there is an optional path to take a few hundred meters before the church) and the small pebbles beach of Axlada (done a few years ago). There was a crucial choice to decide: do we have to go down Axlada, then climb up the mountain again and pass behind, or avoid Axlada and try to reach Vlichada directly. We have taken the first option as there was no pathway since we left the farm on the top. It was clearly awful! Go up on the mountain was quite easy but the descent after to the beach was a nightmare. Very steep slope, a hundred meter of differential, a lot of hesitations, and the temptation to turn around…but stubborn enough to continue. A nice meeting with the farmer on the way back who offered me fresh water from the spring. Nice walk but not an easy one.